Sure-Seal™ saturated foam sealant tape is an advanced, moldable gasket tape for contractors that combines the impenetrable performance of typical sealants with the convenience and flexibility of a tape. This innovative foam sealant replaces caulk, spray foam, putty tape, butyl and other liquid sealants, which can be messy and difficult to apply. Use our foam sealant tape in construction projects to stop air and water from penetrating residential and commercial structures. Saturated foam sealant tape resists UV and ozone degradation and won’t dry out or crack. Sure-Seal™ foam sealant tapes are available from 1/4” to 1-1/4” thick and 3/16” to 39” wide. Foam tape is supplied in rolls on 3” core tubes with a paper liner on one side. LAMATEK also supplies custom foam sealant gaskets with our state of the art die-cutting equipment. Let us engineer custom Sure-Seal parts and gaskets to fit your specific building application. Saturated foam sealing gaskets are supplied kiss-cut on a roll. We can leave the matrix intact or remove it for fast, convenient, peel and stick applications. Sure-Seal™ foam tape is made from a resilient, open cell urethane foam that is impregnated with a proprietary saturant to provide superior sealing qualities without the compression set or limitations of closed cell foams. 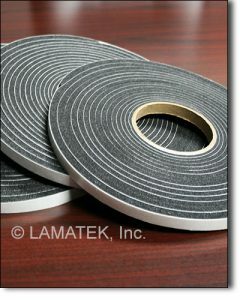 Foam sealant tape conforms to irregular surfaces and bonds with a strong, single-sided adhesive backing. Say goodbye to tedious, messy sealants and switch to Sure-Seal™ foam sealant tape for all of your construction projects. Sure-Seal™ foam must be compressed at least 50% to get the best air and water-tight sealing. It’s easy for contractors to choose correct thickness. Just estimate the maximum gap size and double it!